(replacing The Ace of Space, which had run its course) and finished her run before the October issue of the same title (the month The Blue Lady debuted at another company), she's the only one who came and went before we ever saw Wondy. Feature Comics was published by Quality Comics, the company that would soon be known for heroes like The Black Condor and Plastic Man. USA's introduction was relegated to five pages in the back of Feature #42, with Doll Man taking the cover and the lead position. She shared the back pages with Rusty Ryan, Lala Palooza and Samar of the Jungle. No indication was given as to whether her name was pronounced as a set of initials or an acronym, "Oosa" perhaps. 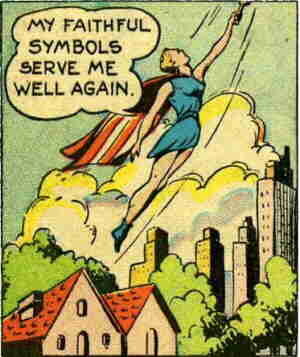 Since comic books are usually lettered without lower-case characters anyway, the fact that her name was rendered with all capital letters didn't necessarily mean it wasn't properly spelled "Usa". She functioned as the living embodiment of the flag itself, and had no mortal identity at all, so whatever her name was, it was the only one she had. The way she became a living embodiment was the same way Mr. Justice and Sgt. Spook became supernaturally-powered creatures  by dying. Her story started in the year 1777, when, as a little girl, she watched the first American flag being sewn. She took a few threads from it as a keepsake, and put them in a locket. Trudging through the snow to show it to her Uncle Sam (no relation, we trust  that would be entirely too precious), she suddenly became seriously ill. She died and was buried, still clutching the locket in her hand. Many years later, someone found the locket in an old cemetery, and opened it. Out sprang a fully-grown young woman, waving the Flag with one hand and brandishing the Torch of Liberty with the other. The Torch, one of the Sacred Symbols she always carried, didn't take much notice of the angle at which she held it. Even pointing straight out and downward, its flames shot straight out the top, and its unquenchable light shone in that direction too. Her first adventure started right after the springing incident, when the Flag, her other Sacred Symbol (which she sometimes waved and sometimes wore as a cape), drooped, alerting her to a schoolteacher leading the children in a pledge of allegiance to their "leader". She quickly took the teacher on a flight across the world, to see where that sort of teaching leads. Most of USA's foes were more menacing than that  spies, saboteurs, etc. That was the sort of bad guy she dealt with, and there was no shortage of that kind of villain even at the time, months before Pearl Harbor, because Americans were as scared of them back then as they are of terrorists today. But she didn't excite much reader interest. She never exceeded her allotted five-page slot in the Feature Comics back pages. Nor did she ever do anything really exciting, such as trade punches with an actual Nazi, like Captain America, who started in the same month, was already doing on a regular basis. Her creator, artist Maurice Gutwirth working with an unidentified writer, was never connected with anything of great interest  his credits include Standard Comics' American Eagle, Marvel's Phantom of the Underworld, and other things of like prominence. USA had seven of those five-page adventures, ending with Feature #48 (September, 1941). In the October issue, she was replaced by Swing Sisson, and USA wasn't so much as mentioned again. Presumably, DC Comics, which lays claim to most of Quality's characters, is the current owner of USA. But DC has never used her, and it's anybody's guess whether today's DC personnel know or care about her. Text ©2009-10 Donald D. Markstein. Art © DC Comics.